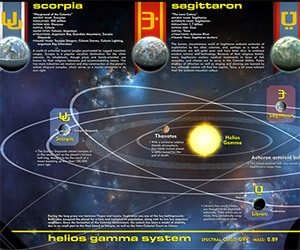 This star system map shows the 12 colonies of Kobol from the TV series Battlestar Galactica and was created with the help of a NASA scientist and the show's co-executive producer. 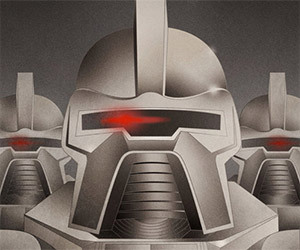 Artist Mark Daniels created this amazing set of print to commemorate the 35th anniversary of the classic science fiction television series, Battlestar Galactica. This terrific set of four prints depicts the various spaceships traveling through the cosmos as seen in the TV series Battlestar Galactica. 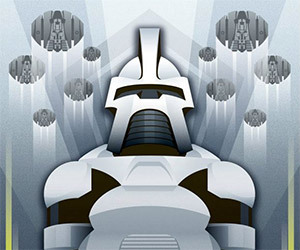 Check out this awesome new series from Boiling Point Creative celebrating the science fiction classics from the 70s and 80s, including Buck Rogers and Battlestar Galactica. 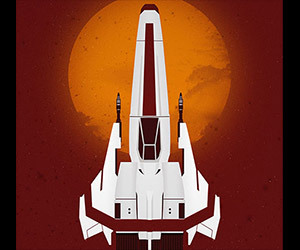 QMx has created this beautiful art print to commemorate the 10th anniversary of the rebirth of the Battlestar Galactica television series. 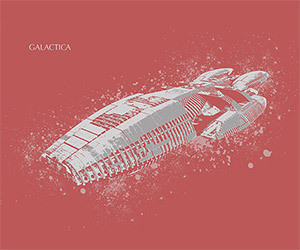 Artist Daniel Price created this lovely set of minimalist Battlestar Galactica prints. 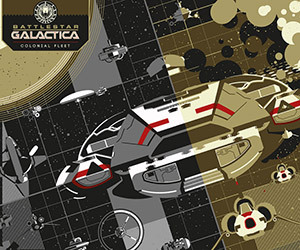 Choose from one of the two different four-print series or the single, Galactica print. 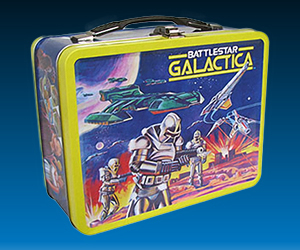 Get your hands on this limited edition Battlestar Galactica 35th anniversary tin tote complete with Boxey, Muffit and Tucana figures. 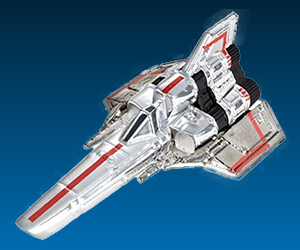 Mattel has announced two special edition Battlestar Galactica Hot Wheels: the Cylon Raider and they Colonial Viper. Available at ComicCon. 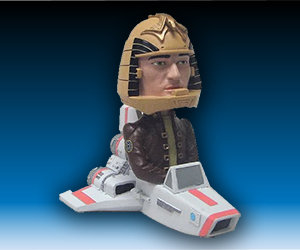 This amazing Battlestar Galactica bobble head shows Captain Apollo commanding his Colonial Viper into battle. 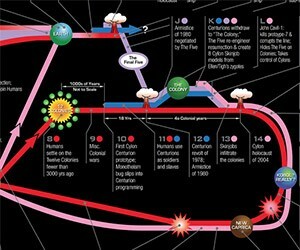 This infographic traces the space and timelines of Battlestar Galactica and Caprica, following the paths of the three intelligent species.